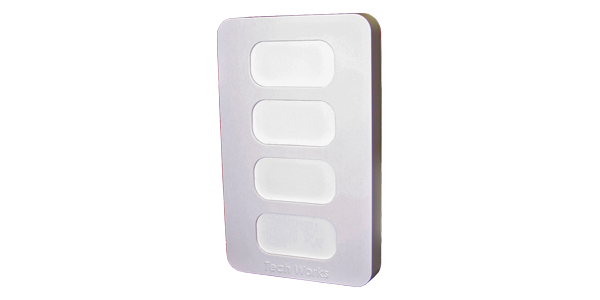 The Tech Works CC-AN-4-*T is a 4-light Intelligent Annunciator panel available ina variety of color options. Standard Color Options are “B” for Bright Colors, Red Yellow, Green, and White, or “P” for Pastel Colors Pink, Ice Blue, White, and Purple, or “N” for No Colors (All White). The 4 windows are back lit by white LEDS and can easily be labeled to correspond to staff or locations such as restrooms or functions such as “Patient Waiting”. A built in tone unit sounds to let taff know that there have been a change in the light status of the annunciator. Intelligent Data Network Communication allows the status of these lights/buttons to be sent to other Intelligent Stations with the same address. Two sets of four-position dipswitches program the Substation address. The first set specifies which Master to display the light status while the second set specifies the column of lights on the Master which correspond to this Substation. All Substations with the same address shall be totally interactive. Pushing a button on the Substation lights either a steady or flashing corresponding light depending on the dipswitch software selection. The annunciator simply displays the light as communicated by the push button station.